1. Pom Pom Throw. I ordered one of these for myself last fall and fell in love with it so hard that I then bought a few as Christmas gifts. It is so cute–just as cute in real life as it is in the picture. The weight is perfect…it’s not too heavy (so perfect for spring and summer months) and even though it says not to wash it, I’ve washed it and dried it on the gentle cycle and it’s been just fine. Also, I always get a little nervous ordering things like this from companies I’m not familiar with, but this arrive within a couple of days of ordering it and I couldn’t have been happier with everything about the experience. 2. Forever Young Sign. I just finished re-watching Parenthood (as a friend of mine said when they stopped by and saw it paused on my Netflix, I probably hate myself) and then immediately, as if Facebook was listening, I saw this sign in my ads. (This was the theme song when it originally aired on NBC, but it is not the theme song on Netflix. It also plays during the last scene of the series finale.) I’ll excuse the creep factor that my ads know exactly what I’m doing because it’s perfect. Whether or not you’re a Bob Dylan fan or a fan of the show, the lyrics are beautiful and the sign is lovely. Sigh. I’ll miss you, Bravermans. Again. 3. Le Creuset Batter Bowl. I have had this bowl for a few years and often use it in blog post photos and I swear, every time I do, I get questions about it. Le Creuset is definitely one of those brands that fits in the “treat yo self” category, but this bowl isn’t nearly as prohibitively expensive as their cookware. It’s the perfect size for batter (because, you know, it’s a batter bowl) and the spout and handle make it perfect for mixing and pouring all sorts of things. Plus, it comes in all sorts of beautiful colors! 4. Rifle Paper Co. iPhone Case. I always have 1-2 extra phone cases lying around for when my current case starts to crack (because I’m a habitual and perpetual phone dropper.) This is consistently one of my favorites! It’s perfect for summer and I always get so many compliments on it. 5. I love Blenders Sunglasses! They’re just expensive enough that I’m motivated not to lose them (plus they’re cute, comfortable, and have just the right amount of tint). Plus, if you follow this link and spend at least $50, you’ll get $20 off your order! 6. I love these Sanuk Yoga Sling Sandals! The soles are made from yoga mats and the tops are made from stretchy knit, so everything about them is incredibly comfortable, plus they’re so cute and a little different. 7. I’m always excited to see what Bath and Body Works has in the summer and their new body scrubs are fantastic. I’ve always loved the smell of coffee and their Coffee Bean Body Scrub is so amazing–it smells like coffee and chocolate and coconut and other tropical things, but it doesn’t leave a brown residue in my shower. They have all sorts of other scents, too, if this isn’t your jam. 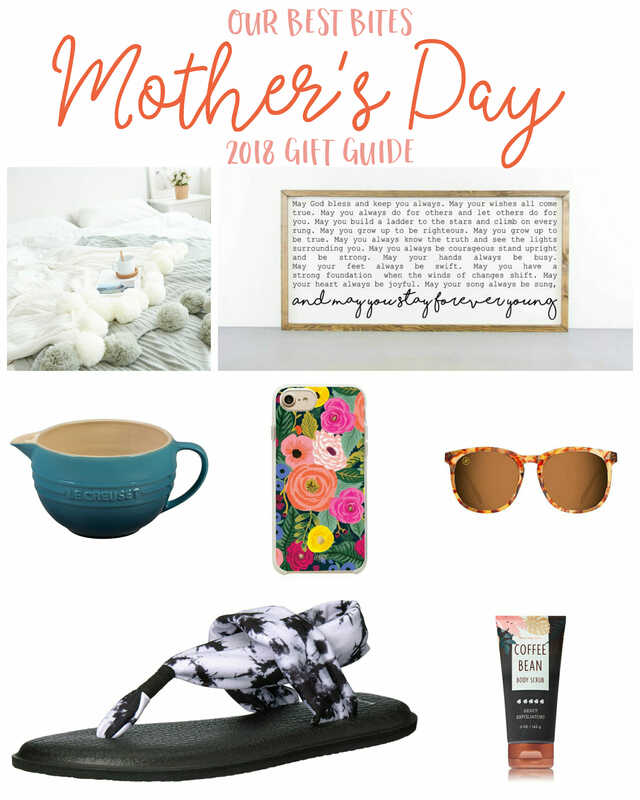 I hope this gives you some fun Mother’s Day inspiration! Have a great week! I love those sandals! I wouldn’t mind getting a pair next month! Awesome ideas, I think those sandals are calling my name. And my mom’s and mother-in-law’s. Thanks! I love the Forever Young sign. We need more positive messages these days!